Wausau, WI – A new medical diagnostic device invented by John A. Viator, Ph.D, an associate professor of biomedical engineering and dermatology at the University of Missouri, Columbia, Missouri, can speed up the diagnosis of metastatic melanoma and may soon help save hundreds of lives. The new device was the outcome of more than five years of research and development at the university’s Christopher S. Bond Life Sciences Center--funded in part by a $33,000 research grant in 2007 from the American Society for Laser Medicine and Surgery (ASLMS). The new photoacoustic melanoma detection device emits laser light into enriched blood cell samples consisting of millions of white blood cells and possibly cancer cells. The light is absorbed only by the melanin within the cancer cells and generates high frequency acoustic responses that are picked up by sensors in a photoacoustic flow meter. The result is immediate detection of melanoma cells—before deadly tumors show up. “We literally listen to the cancer cells passing by,” Viator explains. The ASLMS research grant helped Viator extend the technique to other cancer types by labeling these cells with nanoparticles for optical contrast. Then the cell samples are separated into discrete small droplets separated by air bubbles for easier scanning and detection of both melanoma and non-melanoma cancer cells. 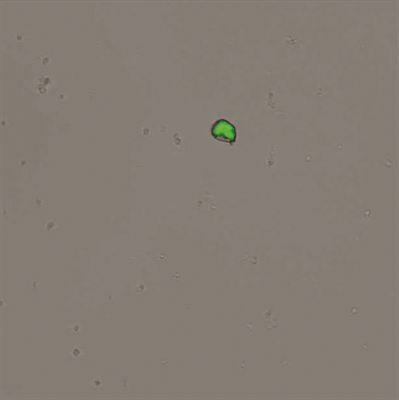 Each microliter sized droplet is irradiated by laser and checked for the presence of cancer cells. The droplets that generate photoacoustic waves contain cancer cells and are separated for further analysis. 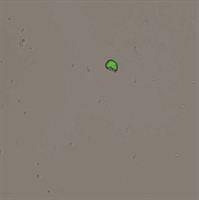 Droplets that do not emit photoacoustic waves contain only white blood cells and are discarded. Although often curable if detected early, melanoma causes the deaths of nearly 9,000 Americans each year. The incidence of melanoma is increasing at a rate faster than that of any of the seven most common cancers. Diagnosis now depends on observation of irregular moles, brown spots or tumors by the patient or the physician. To determine how advanced the disease is for patients with metastatic melanoma and the appropriate treatment protocols, CT Scanners or MRI equipment are often used to detect advancing, marble-sized tumors at a cost of thousands of dollars. Viator believes his new technology will not only ensure early detection of melanoma by spotting circulating tumor cells in the blood, but also be more cost-effective with tests costing approximately $200 each. Development of a commercial prototype for the melanoma detection device (the size of a typical desktop printer) and clinical trials still need to be done to obtain FDA approval, but in two to three years, Viator expects many health care providers will be able to use the device to diagnose and treat melanoma before it gets to advanced stages. He recently formed Viator Technologies, Inc. and signed a license for the patent rights that protects the University’s proprietary interest in the device while allowing other scientists and academia to use the device and methodology for further research and testing. Viator hopes to attract potential investors and manufacturers interested in commercial production of the device through contacts he has made as a nine-year member of the American Society for Laser Surgery and Medicine. He is just one of more than 2,000 biomedical laser professionals from around the world who will attend the ASLMS 32ndAnnual Conference at the Gaylord™ Palms Resort and Convention Center in Kissimmee, Florida, April 18-22, 2012. Participants will explore emerging technologies, the latest diagnostic and treatment advancements and research trends in laser medicine and surgery. Viator will be chairing a session about photoacoustic-based detection of cancer cells on Friday, April 20 at the conference, and one of his students, Sagar Gupta, will report the results of a specific experiment using the new melanoma detection technology. Other leading experts in laser health care will deliver more than 200 scientific presentations at the conference and address numerous disciplines, including experimental and translational research, cutaneous laser surgery, photobiomodulation, surgical applications and interstitial laser therapy. Course content will reflect multiple specialty areas, such as oncology, dermatology, plastic surgery, dentistry, otolaryngology, urology, nursing and allied health, among others. With over 4,000 members, the American Society for Laser Medicine and Surgery is the world’s preeminent resource for information regarding laser and related light energy, research, education and technology. Its mission is to promote excellence in patient care by advancing biomedical application of lasers and other related technologies worldwide. Since 2007, ASLMS has awarded more than $1.2 million in research grants to 32 individuals. Research funds come from members, industry and Annual Conference attendees. For more information about ASLMS and its 2012 Annual Conference, visit www.aslms.org. Online registration for the ASLMS Annual Conference is now open at www.aslms.org. Photo Attached/Caption: Fluorescence image overlaid onto a microscope image of a captured circulating melanoma cell. The green region is fluorescence induced in the melanin within the melanoma cell. Journalists and Bloggers: If you would like to register to attend the ASLMS Annual Conference as a media representative, contact Michelle Theiler at the ASLMS. Contact information at top of release.